This entry was posted on January 23, 2010 at 4:41 pm	and is filed under Movement Forms of Nia, Nia. Tagged: ballet, Carlos Rosas, Debbie Rosas, Duncan Dance, exercise, Isadora Duncan, modern dance, Nia, Nia Energy Type, Nia exercise, Nia Technique, Nia workout, workout. You can follow any responses to this entry through the RSS 2.0 feed. You can leave a response, or trackback from your own site. Duncan Dance is probably my favorite of the dance arts. No, maybe it’s Modern Dance…then again there’s Jazz. Okay, okay, I like them all…but Duncan Dance does have a special place in my heart. I’ve adored Isadora Duncan’s influence on dance for years. I have several books about her life and the movie starring Vanessa Redgrave was just awesome. I have to slyly grin whenever I think about the oh-so-austere audience that must’ve peed (or worse) in their pants when she came out to do her ballet performance naked as a jaybird (never quite understood that term, since jaybirds really aren’t naked). Can you imagine? I don’t know whether I’d have the guts to do something like that, although these days it wouldn’t receive quite the jolting effect as it did in Isadora’s day. The reference to “child-like” is so right on. Duncan Dance is elegantly playful, and playfully elegant. I love to take the essence of Duncan Dance in my classes and open my arms to the heavens (arms open wide to the sky), to the community (arms open wide and running as if ready to greet someone and give them a big bear hug), arms open to the earth, then twirling about the room. 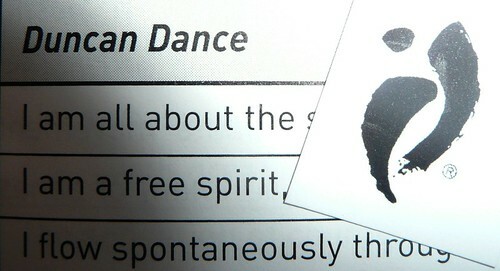 The element of “FreeDance” in Nia is taken from the essence of Duncan Dance…which must be why I love FreeDance so much! I did a whole class with the focus on FreeDance and my students were totally gleeful and exhausted by the end of the hour…it’s a great workout. Thanks again for your delightful posts about the elements of Nia! Well, some of the information I read said that a lot of people consider Isadora Duncan the “mother of Modern Dance”, so sometimes the two seem so much the same to me. I was not aware of her “naked dancing” so thank you for sharing that story. What a woman she HAD to have been to be able to do that. How awesome! Ooooo, I love that: “Duncan Dance is elegantly playful, and playfully elegant” Gonna use that in class! My students are not yet at the point of being gleeful at Free Dance. But I hope that one day they will get there. When I was holding Free Dance sessions the people that did attend were always amazed at what a great work out it is. So fun. Thank you for stopping by with your great comments.